When Nail Yakupov was drafted first overall by the Oilers in 2012, what were your expectations? In retrospect, was he your ideal choice? Would Alex Galchenyuk have been a better option? How about one of the defencemen, because there were some solid ones available that year. Or are you just annoyed the Oilers weren’t worse in 2013, when Nathan MacKinnon and Seth Jones were available, or in 2014 when Aaron Ekblad was on the board? Perhaps you’re in the camp of those who believe that Yakupov was the best available player, and the Oilers had no choice but to take him. Yakupov has skill, and speed. He was just flat out better than most of the players in junior, and maybe that helped raise his stock. But he appears to lack hockey sense, and vision on the ice. He can’t create offence on his own and seems to look confused as to where he should be. Is he truly at best a third line winger? Were you hoping for better than that? Has he simply not been afforded a real chance by his coaches to be better? Is he given every opportunity to succeed? There seems to be somewhat of a divide when it comes to Nail Yakupov, and this story out of the Edmonton Journal from Oilers’ practice is just adding fuel to the fire. Just to be clear, Yakupov didn’t leave the ice. There was some confusion about an optional skate but the above exert is regarding the teams’ full practice this past Saturday. Obviously, there is a level of frustration here. Nail cares about hockey. He cares about the Oilers and he cares about playing well. But his confidence is shot, his spirit is broken, and the team is running out of solutions. Fans on Twitter weighed in with their thoughts on the much-maligned winger. I tend to agree. A player with his skill should produce more. But how many times have we seen guys with all the natural tools who just couldn’t get it done in the NHL. Many a player has come and gone, with a boatload of talent, yet too one dimensional to have success at this level. Is Nail one of those guys who doesn’t provide anything if he isn’t scoring, and thus doesn’t deserve minutes? @4enzix I agree but I see more people placing the burden on Yakupov when the organization deserves an equal share of blame (if not more). It’s particularly interesting that Yakupov’s best CF% is with Hall and Draisaitl, yet hasn’t had enough time with them to produce anything. Have the Oilers not handled his development appropriately? Is usage the problem? Has there been a concerted effort to find the right fit of linemates? 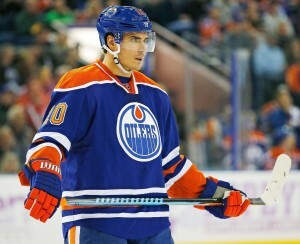 I still believe Nail Yakupov will be a 30+ goal scorer in the NHL. Unfortunately, it just won’t be with the Oilers. Yakupov has his supporters, there’s no doubt. Some fans call him lazy, while others feel as though he wears the disappointment of an organization and that’s not fair. Yakupov has that feisty edge to him, and he doesn’t shy away from physical contact. That’s one facet of his game that really should be built upon, because it will give him another dimension. It’s unfortunate that his value is probably at it’s lowest, and if fans believe the Oilers can get a huge return should he be traded, they’ll likely be disappointed. Head coach Todd McLellan spoke the hard truth. Rough, but accurate. The atmosphere in the Oilers organization is all wrong, and needs to be modified. We throw around the word “culture” in sports, and not everyone buys into it, but there is a reason certain franchises consistently have a level of success. Somewhere along the way, Edmonton become a toxic environment for hockey, and that can’t be remedied overnight. As for Nail Yakupov, you have to wonder if his limited minutes and exclusion from the power play is an indication of what the organization thinks of him. Yet, he continues to be dressed, so this could all be the process that McLellan thinks will help him find his game. We may not have to wait much longer, as the upcoming offseason could provide us with all the answers we need.